Highland Park Village goes for bespoke with a new stable of chic Western accessories. Miron Crosby founders Sarah Means and Lizzie Means Duplantis. While their friends were given jewelry to mark special occasions, sisters (and West Texas natives) Lizzie Means Duplantis and Sarah Means got cowboy boots. “When we went to college, we got TCU boots. When we pledged a sorority, we got boots. And even when I got married, I got boots,” Lizzie says. “They’ve kind of marked our lives.” The gift makes sense for the sisters, whose cousins own Rios of Mercedes, near McAllen, where cowboy boots (including their own) have been handcrafted and hand-lasted in Texas for more than 160 years. 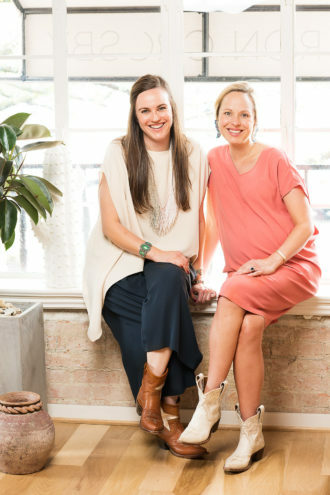 Now the duo is putting their own spin on the shoe, offering eye-catching designs ($900 to $3,400) and bespoke pairs, plus a stable of chic Western accessories, out of their new Highland Park Village storefront, Miron Crosby. If you didn’t place your custom Miron Crosby order in time for Cattle Baron’s Ball (Oct. 21), you can still accessorize with these one-of-a-kind, locally sourced items with a Western vibe. 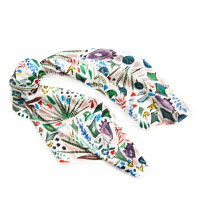 CITY Boots by Dorothy Shain Texas Wildflower Scarf, $150. Two SMU grads came together to create a collection of Texas-inspired silk scarves. 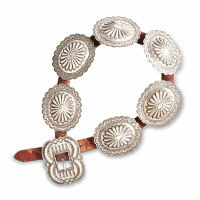 1920s Navajo Silver Concho Belt, $6,500. Miron Crosby carries vintage pieces from world-renowned New Mexico shop Shiprock Santa Fe. Madison McKinley Chokers, $325–$330. 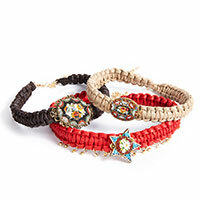 McKinley handcrafts her designs in Dallas, including these macraméd leather chokers. What inspired you to create Miron Crosby? Lizzie: We both moved to New York right after college and would wear them out there—Sarah was in fashion, I was in finance—and people had such a fun reaction to them. We’d always had this dream of bringing our own to market. When we finally decided to put the idea into play, it just snowballed. It feels like it was meant to be. What made you pick Dallas? Sarah: It’s the fashion capital of Texas and, frankly, a fashion capital in America. There’s nothing like this on the market anywhere, but especially in Dallas, which is surprising. We’re doing cowboy boots made by cowboys who’ve been making cowboy boots for generations. We secured this space in Highland Park Village, which is really where we wanted to be, and the response has been great. What makes Miron Crosby different? Sarah: We come at it from a fashion-forward perspective. Our designer is in New York, so our inaugural collection is inspired by the idea of introducing someone to the Southwest. We took her to Santa Fe, then to Frank Lloyd Wright’s estate, Taliesin West in Scottsdale, Arizona, and finally our family’s ranch outside of Marfa. Lizzie: There are jumping stars, birds, flowers, and cacti. We have men’s boots as well that are more classic. 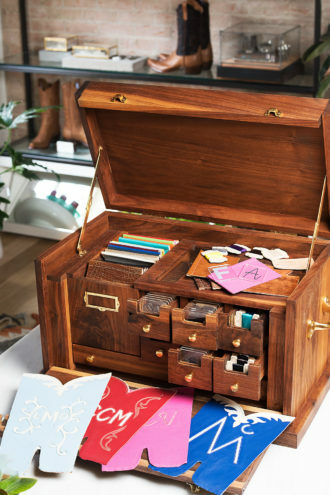 Vamp it Up: Using the “magic box”, customers can select everything from leathers to inlays. How does the bespoke boot process work? 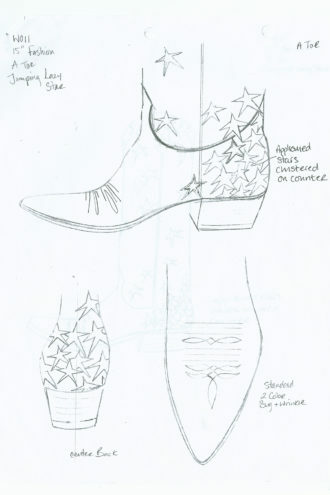 Lizzie: We have what we call our “magic box,” where you can take existing stock styles or more traditional boots, change the color or fabrication, and really make them your own. Custom boots take four to five months to complete. Sarah: I’ll tell you this honestly. We have done so much research on the future of retail and really tried to incorporate—and I hate to use this expression—the millennial thirst for experiences. It’s one of the reasons we wanted to be in this space. You can come in, sit down. We’ll make you a drink, and you can see and feel all the combinations that are possible. Lizzie: We obviously put a bar in the store so you can get real creative with your boots! Sarah: It helps to have a little wine when you buy expensive turquoise.